The Sun is the star nearest to us. It is a huge, luminous ball of gas like other stars in the Universe. 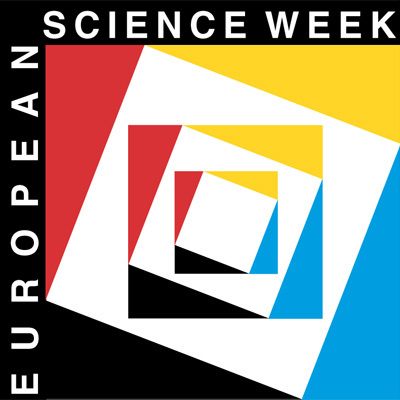 the various phenomena in the atmosphere, like "flares" and "prominences"
There is access to recent solar images (from ground-based telescopes and SOHO), via the dedicated webpage at the Observatoire de Paris. 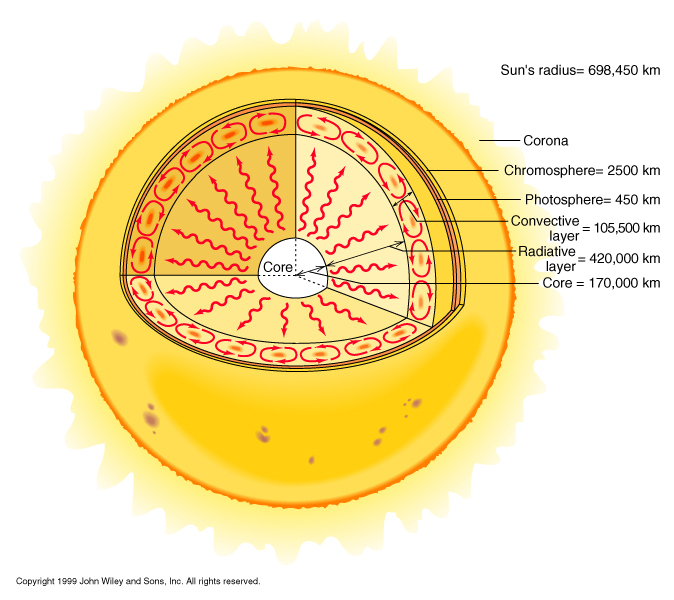 The corona (which means "crown") is the outer shell of the Sun's atmosphere. It is an extremely hot zone with temperatures reaching up to about 2 million degrees; this is caused by the transport of energy from the layers below by means of magnetic fields. You can only see the corona directly during a total solar eclipse. Although as bright as the full Moon, the corona is normally "drowned" in the sunlight that is scattered in the Earth's atmosphere - the daytime sky near the Sun is simply too bright to see the surrounding corona. 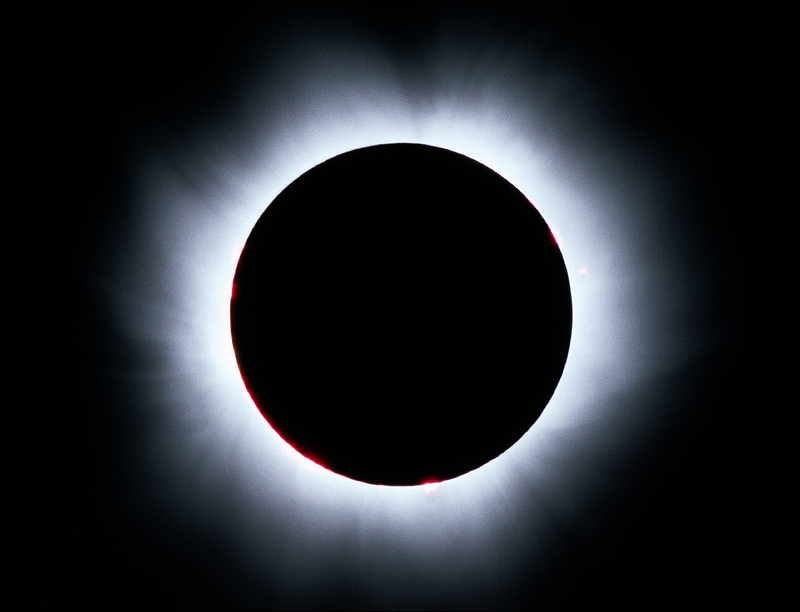 During a total solar eclipse, the Moon blocks the light from the solar photosphere, and the sky is sufficiently dark for the corona to become visible. Professional astronomers have developed a special telescope, a so-called coronograph that makes it possible to see and photograph the corona, also outside solar eclipses. Photo of the Sun's chromosphere. The chromosphere (which means "coloured sphere") is a transparent layer, just above the photosphere. It extends from a few hundred kilometers above the top of the photosphere and outwards to a height of about 2000 km where it merges with the corona. 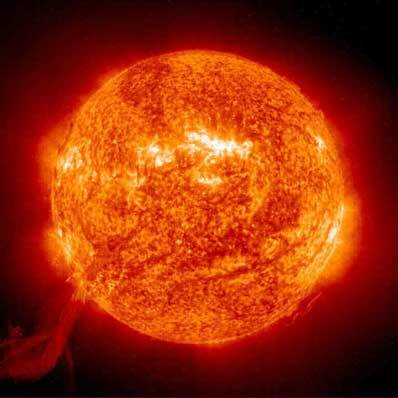 Over this distance, the temperature of the chromosphere increases from 4300 degrees to more than 400,000 degrees. It is a more or less continuous layer. 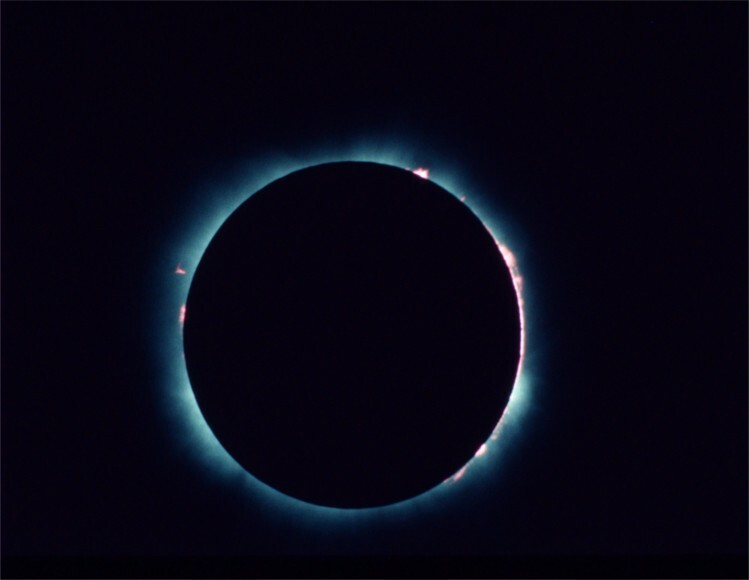 Immediately before and after a total solar eclipse, the chromosphere is visible as a crescent or diamond ring, of reddish colour. Outside eclipses it is visible in the monochromatic light of hydrogen atoms (the H-alpha spectral line). The photosphere is the visible "surface" of the Sun. The name means "sphere of light". From this thin layer - which is only about 300 km deep - most of the Sun's energy is emitted in the form of visible and infrared radiation. It is particularly well visible in white light or in the light of the ionized calcium (the spectral K-line). The temperature in the photosphere decreases steadily from about 6400 degrees at the base to about 4400 degrees at the top where it merges with the chromosphere above. The photosphere has a "grainy" texture with individual cells measuring about 1000 km in diameter. They are called granulation and change every few minutes. They are caused by rising (convective) cells of hot gas. 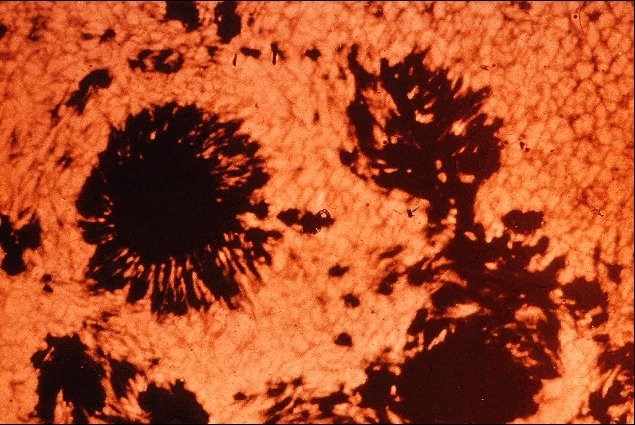 Other photospheric features include sunspots , faculae and filamentary structures, all associated with strong magnetic fields. Almost all features of the Sun's visible-light spectrum originate in the photosphere, including the dark Fraunhofer lines (named after the German physicist who first described them in the early 19th century). 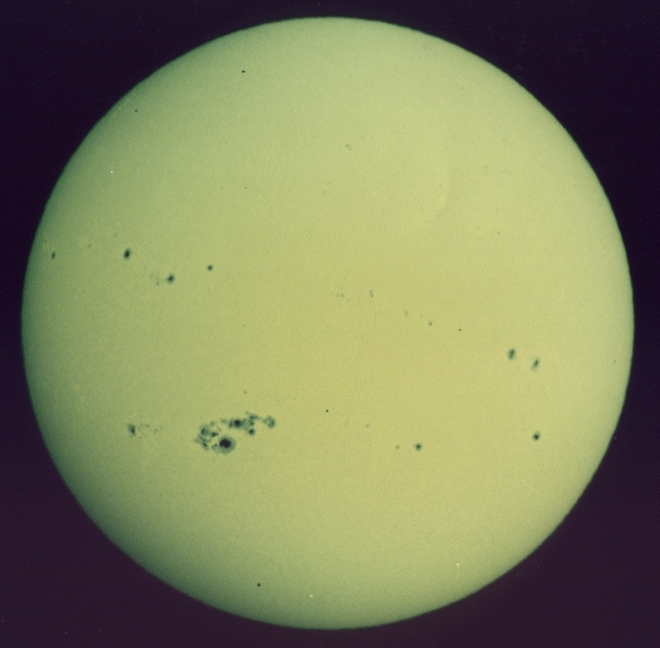 Close-up of a group of sunspots. 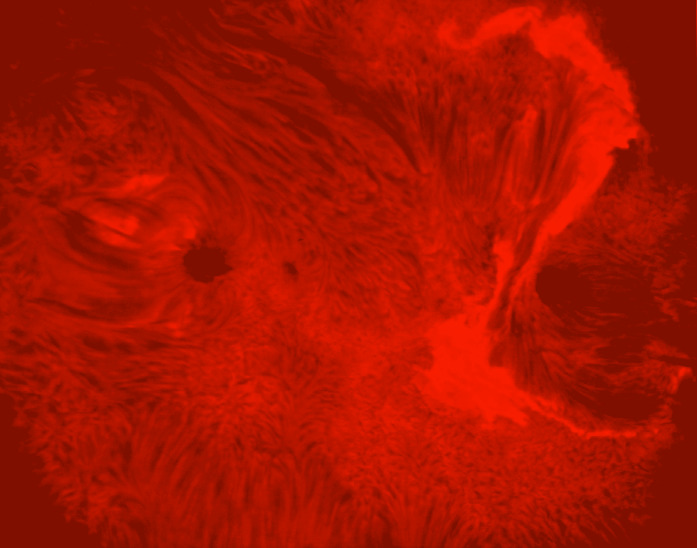 Sunspots are dark areas in the Sun's photosphere, which are cooler than their surroundings. They generally appear in pairs or groups, and are associated with very strong magnetic fields. Spot sizes vary from "small" ones about 15,000 km across (that is, about the size of the Earth) to enormous groups spanning more than 150,000 km. Most of them have a dark central region called the "umbra" (that is about 1600 degrees cooler than the photosphere), surrounded by a less dark region called the "penumbra" (about 500 degrees cooler than the photosphere). The number of sunspots vary in a cycle lasting about 11 years. At the beginning, the Sun is (almost) free of spots. A few spots then appear high in the northern and low in the southern solar hemisphere. Then they disappear and new spots form progressively and nearer towards the solar equator. Both of these phenomena are best visible through special optical filters that isolate the light from hydrogen. The table below contains some of the physical data for the Sun.